Administration and Management in Criminal Justice: A Service Quality Approach, Third Edition emphasizes the proactive techniques for administration professionals by using a service quality lens to address administration and management concepts in all areas of the criminal justice system. 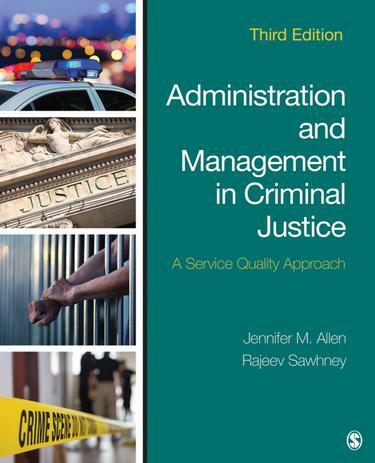 Authors Jennifer M. Allen and Rajeev Sawhney encourage you to consider the importance of providing high-quality and effective criminal justice services. You will develop skills for responding to your customers—other criminal justice professionals, offenders, victims, and the community—and learn how to respond to changing environmental factors. You will also learn to critique your own views of what constitutes management in this service sector, all with the goal of improving the effectiveness of the criminal justice system. Examinations of current concerns and management trends in criminal justice agencies make you aware of the types of issues you may face, such as workplace bullying, formal and informal leadership, inmate-staff relationships, fatal police shootings, and more. Expanded coverage of technology in criminal justice helps you see how technology such as cybercrime, electronic monitoring and other uses of technology in probation and parole, body-worn cameras, and police drones have had an impact on the discipline. More than half the book has been updated with new case studies to offer you current examples of theory being put into practice. Updated references, statistics, and data present you with the latest trends in criminal justice.